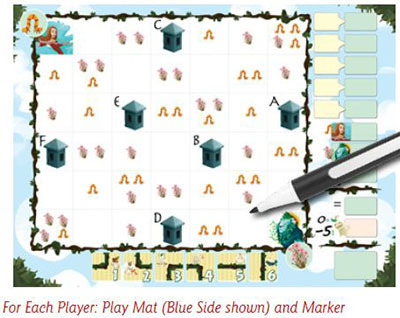 Players draw paths on their play mats, trying to connect features (caterpillars and flowers ) to sanctuaries and guardians. 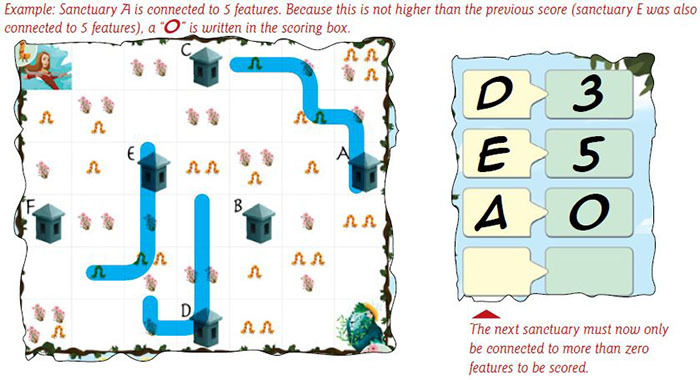 At the end of ' each round, a sanctuary is scored as long as it is connected to more features than the previous sanctuary. All sanctuaries that score no points during the game will result in a 5 point penalty at the end of the game. The player with the most points after five rounds wins the game. Give each player one play mat and one dry erase marker. All players should have the "blue" side of the play mat facing up. The oldest player is the Caller. This player shuffles the path cards and sanctuary cards separately and places them in two facedown decks on the table. 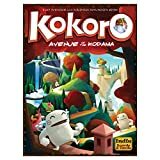 Kokoro is played over 5 rounds. Each round starts by revealing the sanctuary that will be scored at the end of that round. 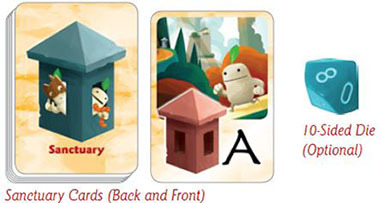 The round has multiple turns, each turn a path card is revealed and all players will add that path to their mats. The round ends after the 4th golden path card is revealed, and the sanctuary is scored. After 5 rounds, the guardians are scored and the winner is determined. The Caller begins the round by placing the top card of the sanctuary deck faceup in the sanctuary discard pile. This sanctuary will be scored at the end of this round. 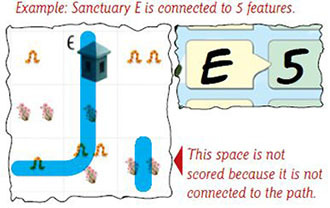 Each player writes the sanctuary's letter in the topmost available white box on the right side of their play mat. Next, the Caller draws the top card of the path deck and announces the number shown. Each number corresponds to a certain path segment, as shown on the card and on the reference table along the bottom of the play mats. You must draw the path segment in a space on your sheet that does not already have a path drawn on it. The path must be drawn exactly as shown on the card/reference table. It cannot be rotated. 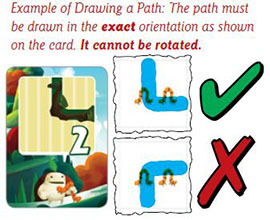 It is legal to make dead ends or to let paths connect to the edge of the play mat. If you chose this action, secretly look at the topmost card of the sanctuary deck and return it to the top of that deck. More than one player can choose this action in the same turn. 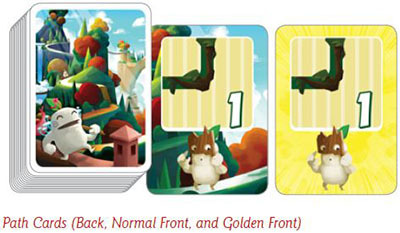 After the fourth golden path card is revealed in the round and the players have completed their turn, the current sanctuary is scored. All players now score the sanctuary that was revealed at the beginning of this round. When scoring a sanctuary, count all of the features (caterpillars and flowers) connected by a path, in both directions, to this sanctuary. Write that number in the scoring box in the right column of your play mat. For a sanctuary, feature, or guardian to be considered connected, a path must have been drawn in its space. A path leading to the edge of its space is not enough. Important: The sanctuary that is scored must be connected to more features (caterpillars and flowers) than the previously scored sanctuary. If the number of features is not higher, you must write a "0" in the scoring box. Zeroes (0) score -5 points at the end of the game. The Caller places all used path cards in the discard pile. Start a new round by drawing and revealing the next sanctuary card. The player with the highest final score wins! In the case of a tie, the tied player with the single highest value in any score box wins. If you score 0 for a sanctuary, the next sanctuary only needs to score at least 1. If you don't manage to score your very first sanctuary (because it's not connected to any features), you will lose 5 points at the end of the game. After playing the base game above, you may choose to play with these optional rules. At the beginning of the game, all the players place their mats so the pink side is facing up. Roll the die to determine where the guardians are for this game. First roll the die and write a small "C" in the upper corner of the corresponding space. This will be the location of the caterpillar guardian. Repeat this process for the flower guardian, writing a small "F" in the upper corner of that space. Reroll the die if the two numbers rolled are the same. The game plays as normal. You may draw paths in the two guardian spaces. At the end of the game score the two guardian spaces as normal. 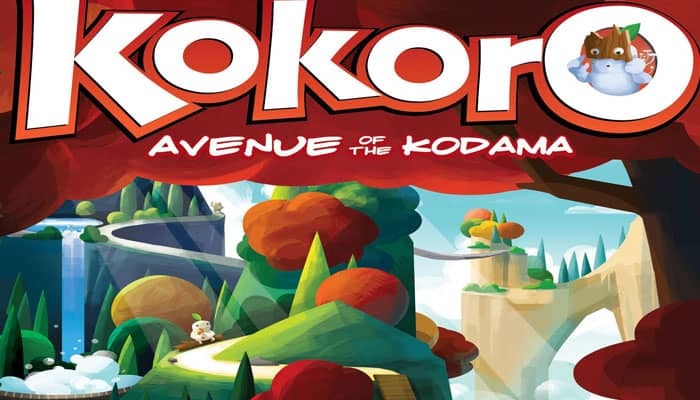 Decree cards add a new rule to each game of Kokoro. 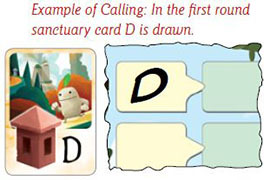 At the beginning of the game, the Caller draws and reads aloud one decree card. This card will introduce a special rule for all players to follow during this game. Keep the decree card visible and accessible to all players. 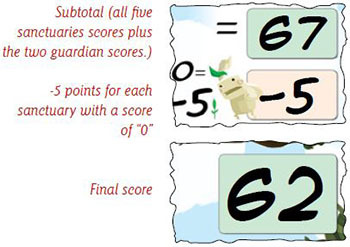 If the card has an additional end game scoring, write your additional score in the box below the flower guardian on the right column of your sheet. Decree cards with a pink background can only be used on the pink side of the play mat. 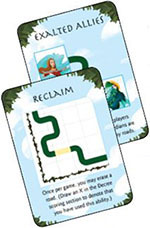 Decrees with blue backgrounds can be used on either side of the play mat. Play the game as normal. Record your top scores and see if you can do better next time.